House lawmakers are intent on giving staff members a raise in 2017, concerned that low pay and long hours are contributing to turnover and congressional brain drain. But the money won&apos;t go very far, according to a Roll Call analysis. Even if every penny of the $8.3 million approved by the House in May is used for staff pay and divided equally among employees in every office — a highly unlikely scenario — it would amount to roughly an extra $1,000 a year for each person. That&apos;s about what the average American worker spends on coffee every year, a recent study shows. This comes on top of years of staff pay stagnation in part due to lawmakers who wanted to make a show of austerity during tight budget years, said Sam Farr, a retiring Democratic House member from California. "We are really doing a disservice to our institution by not allowing to retain the best and brightest people who come to work here," said Farr, who introduced the idea of a staff pay increase in April. The Senate is proposing no such increase. 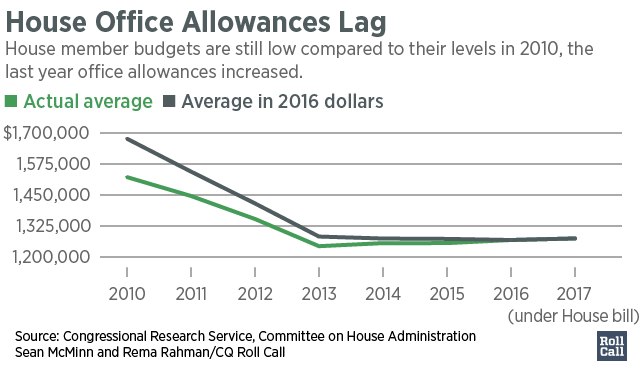 House members haven&apos;t given themselves a pay raise since 2010 and have actually cut office allowances since then. If Congress had regularly increased spending on office accounts to keep up with inflation, each office would have on average $400,000 more that members could choose to spend on staff next year under the proposed increase, according to the Roll Call analysis. Congressional experts and former staff members applauded lawmakers for finally heeding warnings that the legislative branch was losing valuable policy expertise but said it would take much more investment to reverse the trend. "I’m glad that it’s happening, but its pennies on the dollar," said Travis Moore, who was a legislative director for former California Democratic Rep. Henry Waxman, before starting his own company, TechCongress. Few Capitol Hill staffers say they work at Congress for the money. Moore, 36, said he loved his job and would have stayed if Waxman hadn&apos;t retired in 2015 — even though spending cuts meant he earned about $15,000 a year less, in real dollars, than his predecessor from six years before him. But he admitted that many people his age would not be willing, or able, to make the sacrifices he did. In a familiar scenario for many Congressional employees, Moore said his low pay and the high cost of living in Washington forced him to share an apartment with five roommates into his 30s. He made about $50,000 a year when he started at age 29, as a legislative assistant, a $5,000 pay cut from his previous job working for the United Nations. After several promotions, he was making about $85,000 as a legislative director when he left his job five years later. That’s above the 2013 median for the position, which was $80,000, according to a 2014 Congressional Research Service report. Legislative directors are among the highest paid employees in a member’s office, where median salaries in 2013 ranged from $35,000 for a staff assistant to $144,000 for a chief of staff. Median pay for most staff had fallen or remained constant since 2009, according to the 2014 CRS study. In real dollars, median salaries dropped 20.5 percent for staff counsels and 12.6 percent for legislative assistants. Only case workers, who respond to inquiries from constituents, saw an increase of 3.25 percent in the study of salaries from 2009 to 2013. Workers in comparable jobs in the Washington area make considerably more. A 2010 study by the Sunlight Foundation found that chiefs of staff could earn 40 percent more in the private sector than on the Hill and that former staffers who become lobbyists could increase their pay by many multiples. The median rent for a one-bedroom apartment in the District of Columbia was $2,000 in 2015, according to the D.C. Fiscal Policy Institute. Many day care programs around Capitol Hill charge as much for a month of infant care. Such expenses squeezed Nathan Leamer and his wife Amanda out of their congressional jobs when they found out they were expecting their second child in 2013, just three years after they followed Leamer&apos;s boss, Justin Amash, to Congress from Michigan. "He really is a mentor, but you have to pay the bills," Leamer said. At first, the couple was happy to give up their $750-per-month carriage house in Grand Rapids, Michigan, to squeeze into a $1,200-a-month, 500-square-foot Pentagon City basement apartment with their Rottweiler. Leamer made about $40,000 a year as a junior staffer. His wife, a former press secretary for Idaho GOP Rep. Raul Labrador, made about $50,000. When their first baby was born, they moved to a two-bedroom in Alexandria and made ends meet by taking in Leamer&apos;s sister-in-law in exchange for free daycare. But with two children, the situation was not tenable, Leamer said. "I remember sitting in Longworth cafeteria and having a long debate about what we were going to do," he said. Farr noted the high price of living in Washington when he brought up the pay increase during an April committee markup of the Legislative Branch spending plan. The money for staff pay comes out of an allowance that every member is given to cover office expenses, including travel, printing and mailing. Members are given sole discretion over how they divide their allotment, but limited to 18 permanent employees per office. Generally, members spend about 70 percent of their office budgets on their staff, according to the CRS. The proposed raise for 2017 amounts to $18,821 per office. The Roll Call analysis assumes that each member only uses the money for staff pay, employs 18 people and divides the raises equally. Daniel Schuman, policy director at Demand Progress, a progressive advocacy group, said the increase was a step, however small, in the right direction. The last time appropriators increased the account for office allowances was in fiscal 2010, when an average individual account topped more than $1.52 million. Under the proposed increase, a member’s average account in fiscal 2017 would be $1.27 million – almost the same amount it was in 2005. If Congress had continued to increase each member’s account based on the 2010 level, adjusted for inflation, an average account would total $1.67 million in 2016 dollars. That&apos;s a $402,100 difference — assuming the proposal to increase office allowances is authorized by the House Administration Committee in January. Split among a staff of 18, that means an individual employee on average is making about $22,300 less than they would be if such increases were made. Nathan Leamer said the pay raises on the table this year would have been nice, but would not have made much of a difference to his family&apos;s bottom line. Instead, he found his own pay raise. When he left for a job as a legislative and coalitions associate at GenOpp, a D.C.-based advocacy group, his pay jumped by 25 percent. Sean McMinn contributed to this report. State of Pay is an occasional series on congressional staff salaries. If you have ideas or tips, contact Rema Rahman at remarahman@cqrollcall.com and Stephanie Akin at stephanieakin@cqrollcall.com.